Former professional major league baseball outfielder Ken Griffey Jr celebrated his 44th birthday last month. Griffey, the son of former major league ball player Ken Griffey Sr, retired from professional baseball in 2009. He has spent a majority of his career with the Cincinnati Reds and the Seattle Mariners with also a short stint along with the Chicago White Sox. 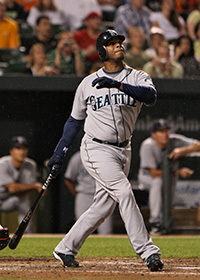 While Griffey has robbed many a players of their milestone home runs, he himself has been an excellent hitter and is considered as one of the most successful home run hitters in baseball history, with his staggering record of 630 home runs which ranks as the sixth highest in the history of major league baseball. Griffey Jr is also on the National Baseball Hall of Fame ballot for 2014. Surely he will be voted in as a new member. Griffey has also received over 10 Golden Glove awards for his exceptional performance as a defender and has also tied the record of home runs in most consecutive games with Dale Long and Don Mattingly. Currently Griffey is continuing to work with the Mariners in their front office as a consultant. He is also one among the 29 players in major league baseball history to have made appearances in games spanning four different calenders. He has also become the seventh person to have been inducted to the Marners' Hall of Fame on August 10, 2013. Ken Griffey Jr, played for Cincinnati Reds in his hometown between the years 2000 and 2008. but his heart always belonged to the Seattle Mariners, whose fans adore him. Griffer has also said that this is the reason why he chose the Mariners to retire from the game. Earlier this month, the iconic baseball player Ken Griffey Jr. now a special consultant with the Mariners took to the social media platform of Instagram to keep his fans and followers entertained even after his retirement. 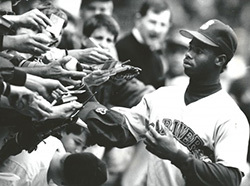 Ken Griffey made his debut appearance in major league baseball when he was 19, over two decades ago. By the time he was 21, he had already gained the loyalty of his fans and followers all over Seattle and the entire nation thanks to his exceptional skills in defense. In an interview in 1991, where Griffey was discussing about a technique on avoiding rug burns from the Kingdome turf, he went on to share the story of his early days of training with his father and how his father had shaped him into becoming the player that everybody recognizes. Ken Griffey went on to make many a milestones after that right up until he announced his retirement in 2009. But that has not stopped this baseball legend from reaching out to his fans. He has now started to do this through Instagram where he has been posting memorable photographs from his illustrious career at the MLB. One of the most famous photographs you can find on Griffey's Instagram feed includes him posing with the rap sensation Xola Malik who is a close friend of Griffey's. While there aren't many pictures on Griffey's Instagram feed, you can only expect more. For the time being, all you can do is follow him: TheRealKenGriffeyJr.